What makes a food trend? Is it when three or more similar new products from different companies debut at a trade show? Is it about booths that seems to garner the most excitement from attendees? Is it when a product seems to perfectly embody not only the values of its core consumers but also ideas lingering on the edge of popularity? Yes to all. 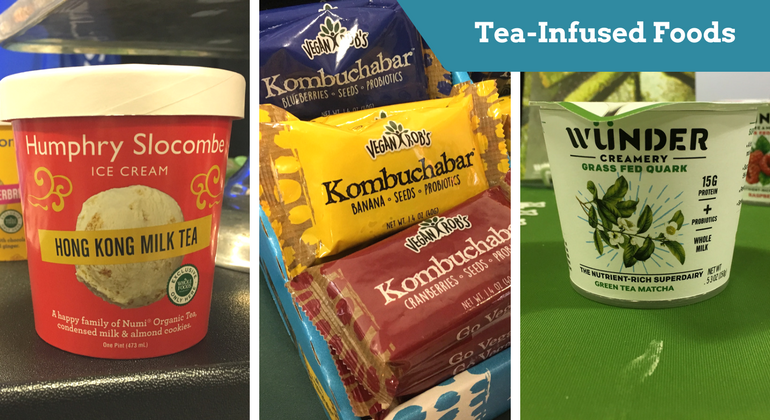 Here, find eight food trends distilled from the Winter Fancy Food Show 2018, complete with savory, sweet and oh-so-awesome product examples. 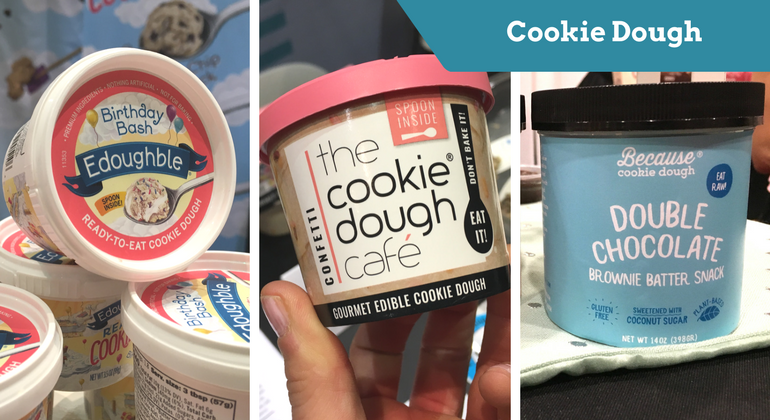 Your mom may have warned you about eating raw cookie dough, but these brands give you the A-OK with cleaned-up, egg-free formulations. Birthday cake-flavored cookie dough? Sounds decadent—and it is. But single-serve packages allow consumers to indulge without feeling too bad about it afterwards. It's also delicious when spooned over ice cream. 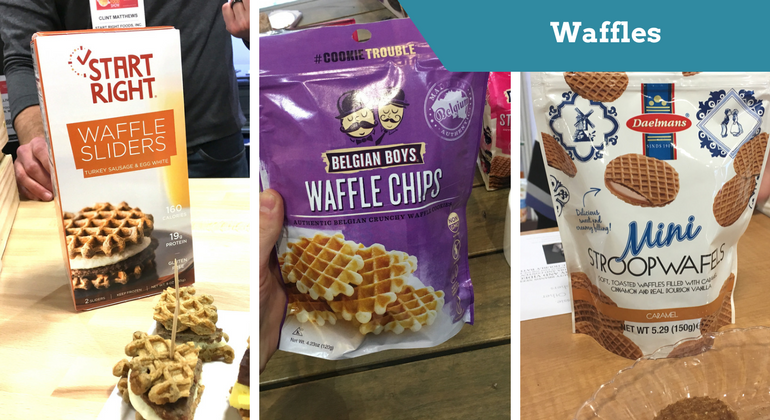 The lazy-Sunday breakfast staple was a popular item at the show, appearing in formats ranging from sweet snacks (waffle chips, anyone?) to a mini protein-packed waffle sandwich encasing sausage and eggs, to classic stroopwaffles. We’re not sure why the crosshatched hot cake was spotted more than its flatter cousin, the flapjack. One theory: Greater surface area allows for more contact with taste buds, making a more delicious nosh. Americans can finally expand their knowledge of Middle Eastern cuisine beyond hummus. 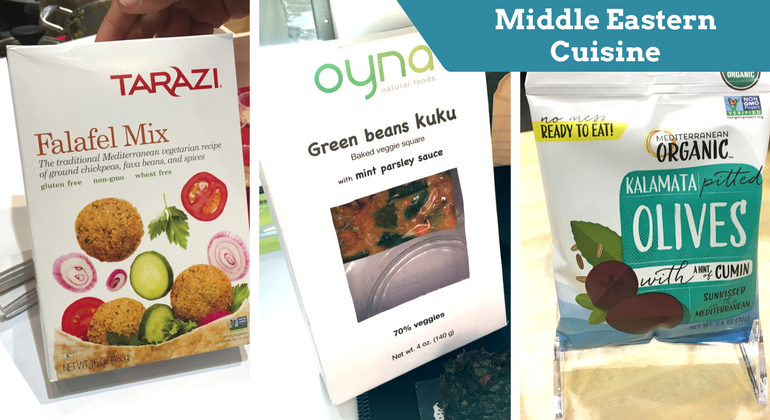 Both new and existing brands exhibiting at the Fancy Food Show launched products that celebrate the ingredients and cooking techniques from countries in and around the Middle East. For instance, we learned about kuku from new brand Oyna Foods. Kuku is a savory, veggie-based Iranian dish held together with a small amount of eggs and garbanzo bean flour. 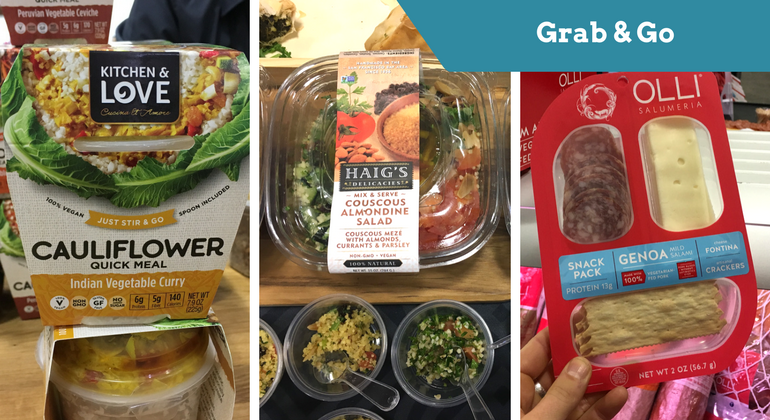 We sampled high-quality tahini paste from forward-thinking small brands such as Obour Foods, which blends tahini with date syrup and pomegranates for a sweet take. 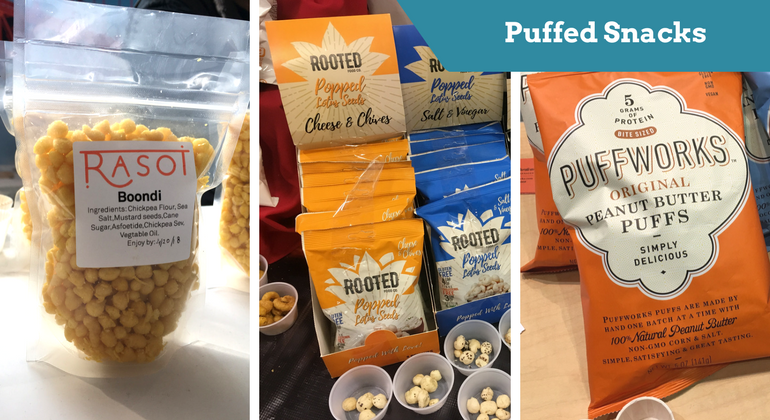 These experiential products, often crafted from nutritious ingredients such as beans, nuts, cassava or corn, are a compelling way to add interest to the snack category. Puffs are a particularly fun way to get a pop of flavor due to their melt-in-your mouth texture. Many puffs featured at the show were coated in cheese and spice. Make like a banana and split! While fried banana chips have been available in the bulk section of retail stores for years (maybe decades?) it’s rare that we’ve seen any brands launching new banana products in packaged food. 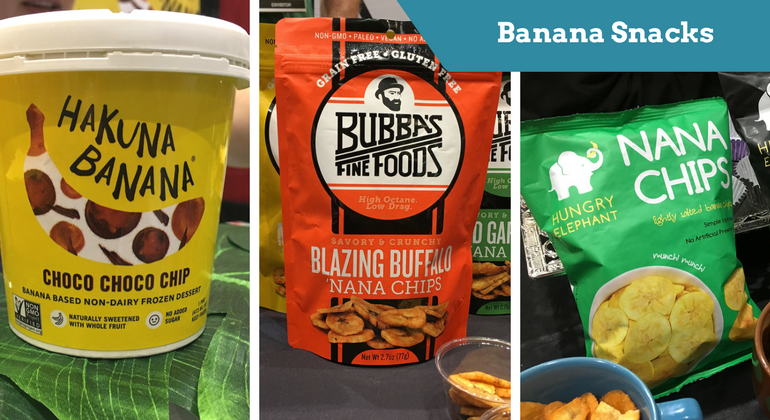 At the show, banana appeared in dairy-free frozen desserts and snacks. Sure, they’re still banana chips. But now they’re dusted with exciting spices, fried in better-for-you oils (without trans fat) and made into nuanced grain-free potato chip swaps. Tea (including Camellia sinensis and the blended herbal variety, tisanes) continues to permeate foods across categories. Verdant matcha tea was a popular choice, tinting quark and kombucha bright green. One brand even incorporated the fermented bubbly tea into an interesting probiotic bar to add tangy flavor and interest. Once upon a time, jerky was available only in convenience stores as a stick made with meat from dubious origins and packed with preservatives such as nitrates and loads of salt. Now, jerky is a popular category that has taken over the snack aisle. Given that most jerky brands prioritize high-quality meats (usually antibiotic free and often grass fed), low sugar and minimal sodium, jerky can be a healthy snack. 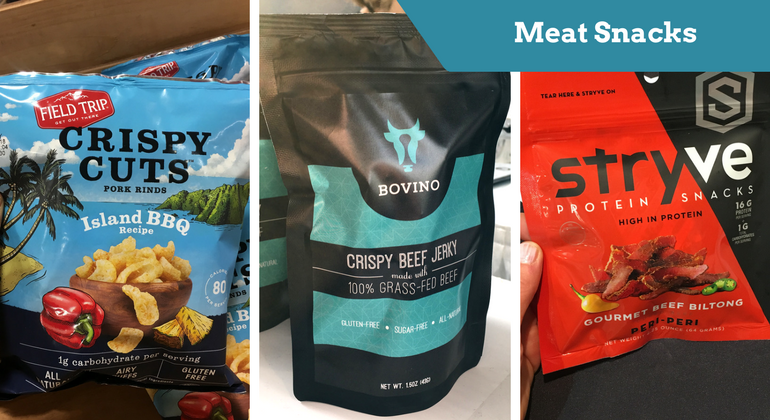 Brands at the Fancy Food Show innovated with air-drying techniques for a softer bite, thinly slicing the meat for a chip-like texture and more. Ideal for retailers who don’t have large kitchens to prep grab-and-go items, these ready-to-eat fresh salads and bowls feature convenient, lunch-perfect ingredients like marinated tofu, cauliflower rice, salads and even a chic meat-and-cheese-and-cracker lunch. Kind of similar to Lunchables, but for adults.